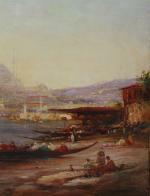 Impressionistic view of river Bosphorus with mosque Hadji Sofia on the background was executed on the turn of 20th century by good listed German landscpae , view and oriental painter Alfred (alfred August Felix) Bachmann ( 1863 Gdansk - 1956 Ambach). He studied: at the Academy in Königsberg under Max Schmidt. Active in 1891 in Munich, in 1941 in Ambach. 1920 S America (La Plata). Yearly. Summer stays in Scandinavia, Iceland and Spitsbergen, in Normandy and on the coast of Schleswig-Holstein, but also in Portugal and in Tenerife, where he found the motives for his seascapes, preferably flat beaches, waves, sea birds and sunsets, but also dunes - and moor landscapes. Less on the subject as at moods interested with impressionistic effects in oil and pastel. B. was also writer, ornithologist and hunter. WORKS DARMSTADT, inst. Mathildenhöhe; HAMBURG, Altona mus. : 6 plants. HUSUM, Nissen´s House: Shell tombs in the tidal flats. KREFELD, art mus. : the sea, oil, 1897 (loss). LEIPZIG, MUS. for image. Arts: The sea, oil. Munich, Bayer. 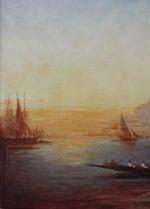 State painting SLG: Sunset, pastel, 1907 (loss). SCHLESWIG, country mus. : self portrait, 1888; North Sea surf, 1897. EXHIBITIONS: 1927 Munich artist cooperative / 1947/48 Regensburg, art action Fuhrmann (CAT.) / 1952 Munich, municipal GAL. (CAT.). -G: from 1887 Munich glass palace / 1903, ´ 09, ´ 13 Vienna, Künstlerhaus / 1949 Munich, Haus der Kunst / 1977 Kampen / Sylt, GAL. Sprat. Literature: Artist lexicons by Benezit (in French); ThB2, 1908; Vo1, 1953; Vo5, 1961 F.Jansa, or image. Artists in Word and picture, L. 1912; Buses, 1977; Schleswig-Holstein. Artist Lexikon, Bredstedt 1984 - art 51:1952 / 53, 50 ss. ; World art 22:1952(18)8; E.Schindler, A.B.., in: ox-head (Hof) 1953(11/12)23; Süddt. Ztg, no. 2654, v. 5.11.1956 (Nekr. ); M.Bernhard, lost works of painting, B. 1965, 142, 155; German artist colonies and artist sites, M. 1976, 78; H. Jähner, the bridge group and German Expressionism, Halle 1978, 264 (DISs. ); M.Angerer, A.B.., in: North Elbingen 53: 1984, 153 ss. -Berlin.